This unit is ideal for aggressively venting cabinets and enclosures. 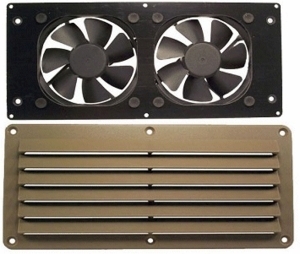 It is self contained and features a large, top-quality brushless fan for higher airflow, low noise, and long life. The fan unit can be configured to pull air out of a cabinet (default configuration) or push air into the cabinet depending on the application. The fans are mounted using a special vibration damping system which eliminates noise caused by fan vibration and also facilitates easily changing the direction of the airflow. The unit is powered with DC voltage and when used with our Universal Power Supplies, can be run completely silent or more aggressively depending on the application. Dimensions (Fan Unit): L - 10 1/8" x H - 4 7/8" x D - 1 5/8"
Req' d Hole Size: 3 3/4" x 7 7/8"